For some, the Epcot International Food & Wine Festival is all about the food. Others enjoy sampling wines from around the globe. Still, there is a select group of people, myself included, who enjoy another perk to this annual tradition: new merchandise, and there’s plenty of it this year. From towels to artwork to clothing to edible goodies, guests will find a variety of items for sale. Let’s take a look at what is up for grabs this year. Image: The 18th Annual Epcot International Food & Wine Festival hosts chefs and “foodies” from around the world during a 46-day celebration of fine culinary cuisine. 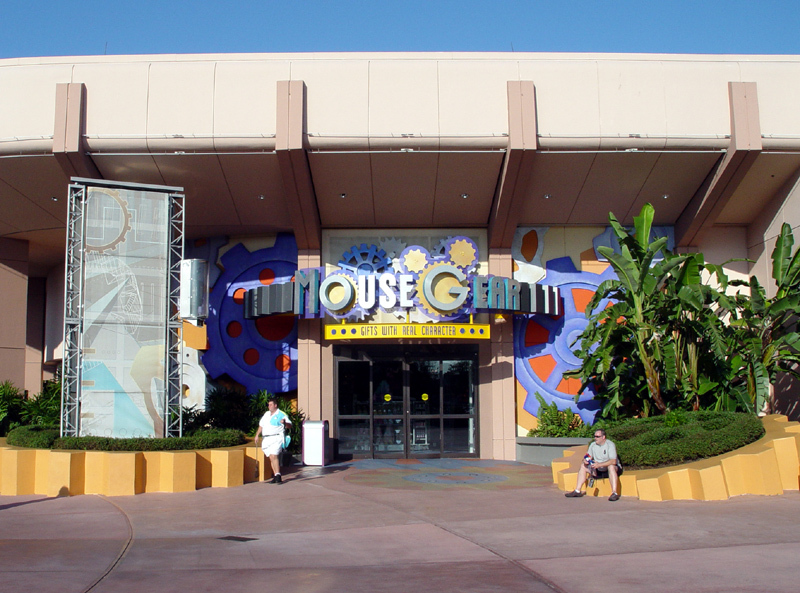 If you’re looking to take a break from all of the gnoshing at the various food booths in World Showcase, take a stroll over to the official Festival Center which is housed in what is the now defunct Wonders of Life pavilion between Mission: SPACE and Universe of Energy; die-hard Disney fans will get a thrill out of being inside of the pavilion which used to be busy with shows, interactive kiosks, and a thrill ride experience focusing on the human body. The center is open from 9 am until park closing and houses an information desk where you can ask questions or get your festival passport stamped, various wine and food seminars, and a large selection of merchandise. Although some of the items are sold scattered throughout the park, the Festival Center has the best display and options for those looking to bring home mementos from the event. The official merchandise for the festival offers something for everyone. Many would assume that the items would be “classic Disney” and have the face of a certain mouse pal on them. However, most of the offerings do not and instead feature the festival logo which I happen to feel is very nice. Nothing “screams” Disney here, so go ahead and splurge for yourself or your friends. Images: Most of the merchandise does not feature a Disney character. Imported specialties including pastas, candies, and condiments make for great gifts. Wine bags, coasters, and aprons are other items one might consider a great souvenir from the festival. Images: Festival logo merchandise can be found in the Festival Center, MouseGear, and at select locations around World Showcase. If wine is something of interest to you, consider stopping at the Festival Center Wine Shop. Row upon row of beautiful glass bottles filled with every type of vino you could imagine are on display and for sale. The selection includes the hundreds which are showcased at the festival marketplaces, so be sure to look for your favorite after visiting the food booths. You can also find bottle toppers, wine glasses, and other accessories nearby; again, some feature the official festival logo which is a nice touch. Images: Stop by the Festival Wine Shop to purchase a bottle of your favorite or attend a wine seminar nearby when in the center. Those looking for a bit of Disney magic incorporated into their merchandise need not worry. A few items are available featuring Donald Duck or an iconic Mickey silhouette like these bamboo plates and cutting boards below. You can also find a new character named Chef Chauncy on many items sold in Epcot. Disney Design Group artist Randy Noble said that Chauncy’s name was influenced by time spent with family in an international atmosphere like that which guests can find at the festival. “His ‘C-shaped’ wisp of hair under his hat inspired his name. I made him a French chef as it was a nice reminder of a trip my wife and I took to France. I turned to a boys’ name book and found Chauncy which seemed perfect!” he explained. Chef Chauncy is such a fun character and really fits in well with the theme of this event. Images: Character merchandise featuring Mickey and friends as well as Chef Chauncy is sure to be a hit at this year’s festival. Epcot fans have been boasting of eating (or drinking) around the World for years now. Finally, Disney merchandise is catching up to this phenomenon with two new logos on t-shirts, hoodies, tumblers, and novelty sunglasses paying homage to the experience. The “Brews Around the World” line celebrates the beers of the World Showcase countries while a “Taste Your Way Around the World” design focuses on the foods. Kudos to Disney for paying attention to some of the classic experiences guests have enjoyed for so long. Images: Show off your festival pride with these two new designs featuring the foods and beverages of the World Showcase. Overall, I am really happy with the variety of merchandise available at this year’s Food & Wine Festival. There is something for everybody whether you are new to the kitchen or a trained chef. If you like Disney characters, you’ll find a collection for you and those looking for a little less branding will find items as well. I hope you find that special souvenir during your visit to the festival. I know I will! Let us know what your favorite item is from either this year’s festival or one in the past by commenting below. We’d love to hear about your special purchases! The 18th Annual Epcot International Food & Wine Festival is here! Thanks, Nicky – I was at Food and Wine last year for only a couple of hours and was disappointed in the limited merchandise in the booths around World Showcase. Now I realize I was looking in the wrong place. Hope to have the chance to remedy this mistake during a future visit. I’m impressed too. I really like the variety of items they have this year, and Chauncy is a hoot! I think I might forgo the passport and buy a shirt and get that stamped instead! Does anyone know where to purchase the gift cards to use at the various vendors at the Food and Wine Festival? You can use any Disney Gift Card bought either at a Disney Store locally or any of the shops on WDW property. You can also find them at the stores in the airport. If you want the F & W Festival themed card, they are found at kiosks around World Showcase and in the stores. OMG!! Is there any way to get a closer picture of the aprons? I especially like the one with the French pastries on it. I hope to get to do F&WF next year! « Adventure Ocean on the Oasis of the Seas – How Does It Stack Up To Disney’s Oceaneer Club and Lab?